The internet was alight with excitement over this year's Super Bowl halftime act, and much of that energy was in response to the show's tremendously-cool light show. Many believed that the flowing stars and stripes on display above Lady Gaga were the work of a green screen or projectors, but the truth is way more high-tech than that — the light show was the result of 300 synchronized Intel-powered Shooting Star drones equipped with multi-colored LED panels. 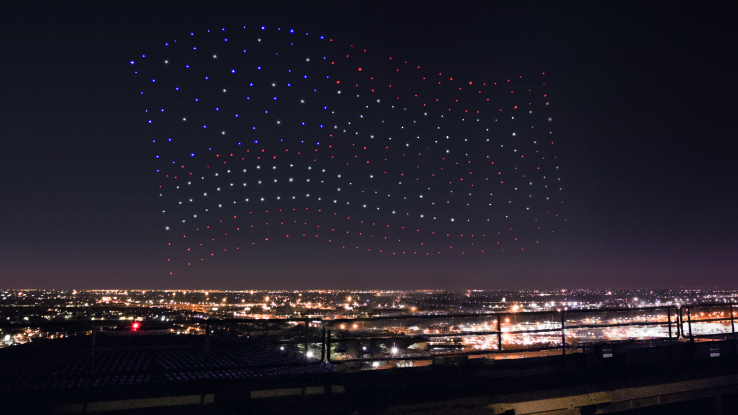 The drones' stunning visual display comes as a result of specific computer software, also called Shooting Star, that allows for the programming of pre-set flight patterns. The drones themselves are very basic, comprised largely of a Styrofoam housing and metal cages around each prop, and lack any on-board means with which to avoid collision. All movement and coordination is handled solely through the Shooting Star software. Intel has been working on the Shooting Star program for around two years, and one point collaborating with researchers at Ars Electronica Futurelab in Linz, Australia. Their efforts aren't merely for artistic efforts, either — Intel believes that drone fleets might be useful in the future for tasks such as equipment inspection or search and rescue missions. For now, of course, spectacular light shows are plenty cool enough to capture the public's admiration.